This weekend was bittersweet. Which is not to say it wasn’t fun. It really was! My 8-month-old nephew Tucker was in town, tireless parents in tow. A little picnic in the park, a lotta sun down by the water, a perfectly manicured (and timed) splash pad. 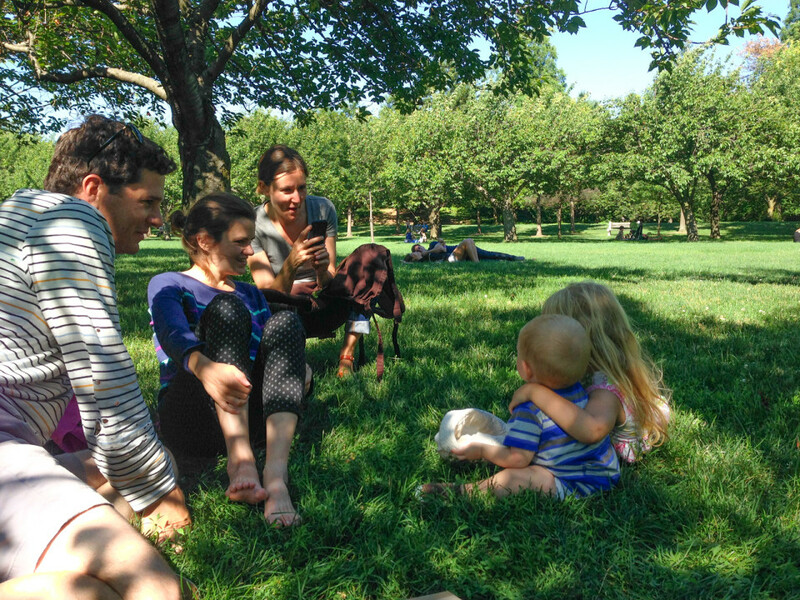 Ice cream and iced coffee, all the usual diversions for young families in Brooklyn. My phone recorded 125 moments on Saturday alone. We were exhausted Monday morning, a sure sign of a weekend well spent. The bittersweetness stemmed, like it always does, from my own unspoken expectations. With a baby in the apartment, I had expected to feel nostalgic, joyous flashbacks to early parenthood. Like, really feel them—I was looking forward to it. And, while I recognized many motions and moments from Charlotte’s first year in Tucker, I still felt firmly rooted to the present. I was sad to learn that the visceral feeling of that frantic first year has faded. Last night, in the process of overthinking this, I pulled up some pictures of Charlotte from when she was Tucker’s age. Mags put down her work and teared up. And, in looking at one picture in particular, I finally felt what I had hoped to feel last weekend: Charlotte’s weight on my neck, her baby breath, and her mouth full of new teeth firmly chewing on my nose, exactly four summers ago. There is only one solution: have another! Unfortunately, this causes time to go EVEN faster…sometimes I swear I can almost see them growing. And memories of the first year, round two, fade in moments. Thank you human biology, for making us forgetful yet nostalgic enough to want to do it again and again. That lovely new baby smell is enough to put anyone over the edge. I’m trying not to sniff the newbies these days; cannot be trusted.